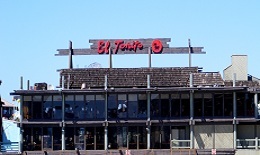 El Torito Redondo Beach offers great views of Palos Verdes, beachgoers in Redondo Beach and the Pacific Ocean. The restaurant serves fresh authentic Mexican dishes and the salsa are made fresh daily. Enjoy the flavors of Mexico, phenomenal views and their tasty margaritas! Fresh Tableside Guacamole- Prepared just the way you like it with fresh avocados, spicy Serrano chilies and a special blend of herbs and spices. Adobo Chicken & Avocado Rolls- Bacon, black bean-corn relish and salsa picante wrapped in crispy flour tortillas. Roasted Pasilla Chile & Cheese Quesadilla- Grilled with a hint of garlic until crisp and golden brown with Pico de Gallo and salsa picante. Available with grilled chicken or grilled steak. “No Bull” Nachos- A mound of warm chips, melted cheese, refried beans and guajillo chile sauce topped with fresh jalapenos, tomatoes, green onions and guacamole. Available with shredded chicken or shredded beef. Get You Mex Fix- Adobo chicken and Avocado rolls, Mexican Buffalo Wings, Taquitos Rancheros, Cheese Quesadilla, Beef Tostaditas and Fresh Guacamole with dipping sauces. Taquitos Rancheros- Four crispy corn tortillas filled with barbacoa beef. Drizzled with chipotle crema fresca and guacamolito. Mexican Buffalo Wings- Our Mexican twist on a classic favorite served with carrots, celery and ranch dip. Tostada de Ceviche- Citrus marinated mahi-mahi, wild Mexican shrimp, guacamole, Serrano chilies, tomatoes, onions and cilantro over a crisp corn tostada and fresh greens. House-Made Tortilla Soup- Our original recipe made fresh every day! Chicken broth, tender chicken, garden-fresh vegetables, jack cheese and fresh avocado. Mexican Caesar- Our signature side Caesar with romaine, cotija cheese, tomatoes, roasted pepitas and crisp tortilla strips tossed with our Cilantro-Pepita dressing. Tableside Fajitas Salad- Grilled chicken breast, romaine, cotija cheese, fresh avocado, roasted pepitas, fresh Pico de Gallo, crisp tortilla strips tossed tableside with Serrano-grape vinaigrette. Available with grilled steak. Grilled Chicken Mexican Caesar- Romaine, cotija cheese, tomatoes, roasted pepitas and crisp tortilla strips tossed in our Cilantro-Pepita dressing. Grilled Chicken Taco Salad- Crisp romaine, grilled chicken, fresh avocado, cotija cheese, roasted pepitas, crisp tortilla strips and fresh Pico de Gallo. Tossed with your choice of dressing. Grilled Chicken & Avocado Salad Lite- With romaine, queso fresco, crisp jicama, red bell peppers, pasilla chiles, onions, frijoles de la olla, mango-mint relish and lite Serrano-grape vinaigrette. Served sizzling with sautéed garden-fresh vegetables on a cast iron skillet. Accompanied by guacamole, warm flour or corn tortillas, our signature sweet corn cake and a choice of two: frijoles de la olla, rice or zesty fruit ensalada. Grilled Chicken Breast Fajitas- Citrus-chipotle marinated fresh chicken breast. Grilled Steak Fajitas- Chipotle-garlic marinated steak. Shrimp Fajitas- Tender shrimp sautéed in jalapeno-garlic butter and guajillo chile sauce. Ignited 1800 Fajitas- Chipotle marinated grilled steak and chicken breast with sautéed shrimp sizzling together and flamed right at your table with 1800 Silver Tequila. Fajita Duo- Select two of your favorites, grilled chicken breast, grilled steak or sautéed shrimp. Fajita Combo- Grilled chicken breast fajitas, grilled steak fajitas and a cheese enchilada. Veggie Fajitas- Fresh zucchini, spinach, potatoes, peppers, carrots, squash, green beans, onions, fresh rosemary and mint leaves with a grilled chile relleno. Zesty fruit ensalada or sautéed vegetables may be substituted for rice and beans. Chicken & Sour Cream Enchiladas- Tender chicken simmered and smothered in a savory sour cream sauce topped with cheddar cheese. Served with refried beans and rice. Sizzling Enchiladas- Served sizzling on a skillet. Grilled chicken with tomatillo-poblano sauce and jack cheese. Served with fresh guacamole, frijoles de la olla and rice. Available with grilled steak. Enchiladas Rancheras- Melted jack cheese with ranchera sauce served with guacamole, refried beans and rice. Available with shredded chicken or shredded beef. Shrimp Mazatlan Enchiladas- Sautéed with tomatoes, pasilla chiles, onions and jack cheese with fire-roasted tomatillo and tomato-jalapeno sauces. Served with frijoles de la olla and rice. Carne Asada Burrito- Grilled steak rubbed with spicy chile de arbol adobo, roasted spicy pasilla chiles, onions, frijoles de la olla, fresh guacamole, jack cheese and salsa picante. Served with refried beans and rice. Burrito Especial- Seasoned shredded chicken or beef, jack cheese and ranchera sauce. Served with refried beans and rice. Spinach Enchiladas- Sautéed fresh spinach, pasilla chiles, onions, Pico de Gallo, melted cheddar cheese and fire-roasted tomatillo sauce. Served with frijoles de la olla and rice. Combo 2: A spicy fire-roasted pasilla chile relleno with melted manchego cheese and a jack cheese enchilada. Combo 3: Handmade chicken or roasted carinitas tamale with a jack cheese enchilada. Combo 4: Two jack cheese enchiladas and a shredded chicken or beef crispy taco. Combo 5: Two shredded chicken or beef crispy tacos and a jack cheese enchilada. Combo 6: A jack cheese enchilada, a handmade chicken or roasted carnitas tamale and a shredded chicken or beef crispy taco. Macho Combo- Four of our most popular items on one platter: a spicy fire-roasted pasilla chile relleno, a chicken and sour cream enchilada, a shredded chicken or beef crispy taco and a handmade chicken or carnitas tamale. Sizzling Combo- Shrimp sautéed with fajita vegetables and a chicken enchilada served on a sizzling skillet with spicy steak soft taco frijoles de la olla, rice and warm tortillas. Mahi-Mahi Tacos- Three mahi-mahi beer-battered tacos topped with ginger aioli, cabbage, caramelized onions and avocado. Served with rice. Carne Asada- Tender gilled 10 oz. skirt steak marinated with spicy chile de arbol, topped with a cheese enchilada and tomato-jalapeno sauce. Served with fresh guacamole, frijoles de la olla and warm tortillas. Carnitas en Tablita- Slowly simmered in garlic, oranges and spices, our tender pork is served with a fiery grilled toreado, grilled Mexican cebollita, fresh avocado, frijoles de la olla and warm tortillas. Carne Asada and Wild Mexican Shrimp- 5 oz. skirt steak and Wild Mexican shrimp with frijoles de la olla, rice, fresh guacamole and warm tortillas.